Bold-faced players did not appear on my 2013 teams. For all the fanfare about Molina as a possible MVP candidate one of these years, Jonathan Lucroy has more than a 2-WAR lead on him over the past calendar year. Two. WAR. That's insane. Both are excellent pitch framers as well. Despite Goldschmidt's marginal lead in WAR, I'm giving Freeman the nod here because he's been so terrific both this and last year...while Goldschmidt has struggled a bit this year. Freeman is a player that I always underestimated, but he's sure looking worth his extension this past offseason. He has posted nearly equal offensive numbers to Goldschmidt's over the past 365 days, while at the same time playing in a weaker offensive environment in Atlanta. I know that Carpenter has moved over to his "native" 3B this season, but I'm giving him the nod at second base for arguably homer-ic reasons that you'll see in a moment. You could make a great case for Chase Utley, who is still an excellent player and a long-time crush. But I'm giving it to Carpenter, who has just been so amazing over the past year...and because I want to give third base to someone with more WAR than Chase Utley. 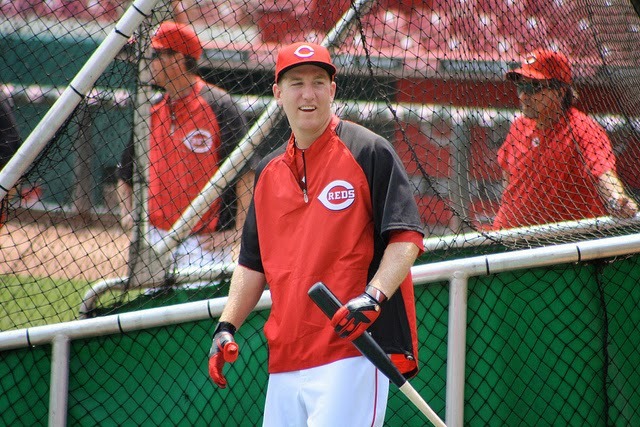 Todd Frazier has had a terrific season this year, but the secret seems to be that he also had a very good season last year. His batting average was low last year (luck dragons? ), but his other numbers--while a step down from 2012--were still pretty solid, and resulted in dead-on league average production (100 wRC+). For the reserve, I'm passing over Juan Uribe (4.5 WAR in limited play) because I'm a little skeptical of the +20 fielding rating. Instead going with young stud Anthony Rendon, who has been terrific this season after a solid rookie campaign last year. Hanley had an amazing second half last year, and has been pretty good this year. But nothing compares to what Troy Tulowtizki has done over his past 145 games...during which he's been healthy! Tulo is the bestest. The player with the second-most WAR in all of baseball is Andrew McCutchen. I knew he'd been amazing, but I had no idea that he was second only to His Greatness. I've written about my love of Carlos Gomez, and and I gave Giancarlo Stanton the nod over Hunter Pence because I love Giancarlo a lot more the Pence. But I'm nevertheless incredibly impressed that Pence is where he is. Puig seems pretty likely to crack the starting lineup by next season, but deserves to be here. The last player, Werth, gets the nod over Jayson Heyward because I trust Werth's negative defensive rating less than I trust Heyward's positive rating. Werth is player who often has popped up in this exercise over the past, but rarely gets much consideration for the actual team. Kershaw should not be a surprise, nor really should any of the names on this list. The biggest "snub" that visitors of this blog are likely to notice is Johnny Cueto, who clocks in at 2.9 WAR over the past calendar year. This is the "cost" to opting to include the second half of last year's data in these rankings, but I think it's the right call. Otherwise, where is the recognition of second-half performances? Just my opinion. I'm giving Chapman a bump because of playing time and homerism. But wow, I had no idea that Steve Cishek was doing what he's been doing. It's a nice (refreshing?) indication of how far removed I am from fantasy baseball that I didn't even realize that he was Miami's closer. He's been amazing, though, and on par with these other guys. Tony Watson narrowly got the nod over his fellow Pirate Mark Melancon, but I went with Watson because his numbers are (very slightly) better, and it's nice to have another lefty. Were it not for my movement of Carpenter to 2B to get Frazier a job, Murphy would have gotten the reserve 2B job. The others are good, quality players, who might be even better in the future. But they're not really in the same conversation as the guys who did make the cut.